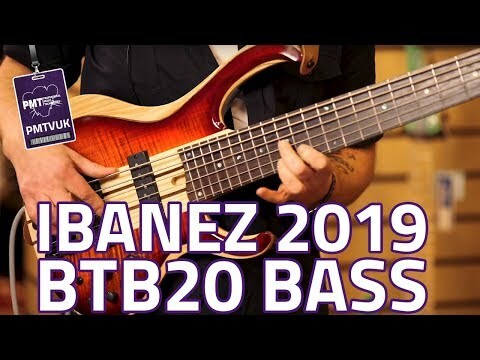 20 years ago Ibanez introduced the world to the BTB bass series, offering players the chance to own a boutique-style instrument for an attai..
20 years ago Ibanez introduced the world to the BTB bass series, offering players the chance to own a boutique-style instrument for an attainable price. Now you can get your own Ibanez BTB 20th Anniv Celebration 6 String Bass Brown Topaz Burst in this gorgeous limited edition finish! Made using some of the finest tonewoods available, the BTB20TH6 would make a fantastic addition to any bass collection. Featuring that familiar neck-through construction - a hallmark of the BTB range - this bass naturally produces a massive amount of sustain, and increased levels of stability. Flanking the neck is a pair of Ash/Okoume wings that have been topped with a striking Flamed Maple cap. To top off its already distinguished look, the wings on the BTB20TH6 are finished in a gorgeous Brown Topaz Burst. Sitting pretting atop the neck you'll find an exotic Panga Panga fretboard, which produces a tight low and mid range, but with a sharp high-end attack. This fingerboard is adorned with 24 stainless steel frets, and even has a Zero Fret to provide pin-point intonation accuracy. As a final touch, there's a cutting edge MR5S bridge fitted. This bridge fully isolates each string, and offers the maximum amount of vibration transference. Not only that, but each sadle is adjustable, allowing you to space the strings according to your needs! An inspired choice for the BTB series, Nordstrand Big Single pickups are renowned for producing a big and meaty sound, that's full-bodied, powerful, and aggressive, yet with all the clarity of a Single Coil pickup. Complimenting these pickups is an Ibanez Custom Electronics 3-band EQ with a 3-way mid-frequency switch, offering you a variety of tonal variations to suit a wide range of playstyles. Whether you want to play simple chords or complex solos, this EQ can offer settings to suit. Contact out Online Sales Team or your Local PMT Store today to ask about the availability of this fantastic instrument!